One of nine charges has been dropped against the TD. 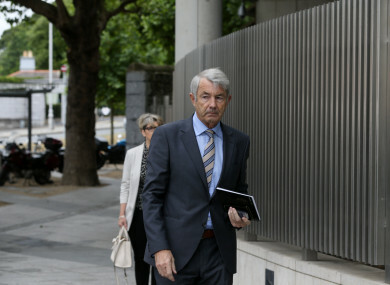 Michael Lowry arriving at the CCJ. MICHAEL LOWRY’S POLITICAL secretary has told a jury that in August 2002, the politician asked her to oversee a payment of £250,000 to an individual for money owed on a property deal. Aileen Dempsey told Michael O’Higgins SC, defending Lowry, that she was an employee of the Independent TD for 30 years as his secretarial assistant and was paid by the Oireachtas. She worked out of his company office, Garuda Ltd, who traded as Streamline Enterprises. She said Lowry was on extended leave in August 2002 when she got a phone call from Kevin Phelan who said he was due a payment from Lowry in respect of a property deal. She said she knew Phelan had met him before. She said it took her a few days to get in contact with Lowry; she relayed the message and he told her there was commission due to Garuda from a Finnish refrigeration company, Norpe OY. Dempsey told Dublin Circuit Criminal Court that he instructed her to raise an invoice from Streamline Enterprises for that amount and told her to oversee the payment of this money to Phelan. She said Lowry told her he had “cleared” the transfer of the money to Phelan with the CEO of Norpe OY. Dempsey said she rang her contact in Norpe to enquire as to what the euro equivalent of Stg£250,000 was “so that when the invoice landed there wouldn’t be a hiccup”. She got a call back from Stella Lipponen in Norpe who told her that the invoice had to come from Kevin Phelan. “I relayed that information to Phelan. I told him that Michael had cleared the payment with the CEO in Norpe but an invoice had to come from him or his company in respect of the £250,000,” Ms Dempsey said. She said she got a call from Norpe to say the payment had gone through and they faxed through a copy of the invoice they had relied on when issuing the payment. “What did you do with the invoice?” O’Higgins asked. “As far as I was concerned that was the end of the transaction. As I deal with queries and finalise them I put a line through them and put them in a storage box. That box is later taken down to a store,” Dempsey said. She said in January 2007, she got a call from Michael Lowry’s accountant who said he would fax her through a letter that she was to type up on Streamline headed paper and get Lowry to sign. Dempsey said the letter was also dictated to her and she was informed it was an important letter. She said it was stressed to her that it had to say this was commission due to Garuda for the year end 2006. The letter, which was an exhibit in the case, was dated January 15, 2007 and addressed to Neale O’Hanlon, a partner in accounting firm BBT, the practice employed by the TD. It was signed by Lowry. The letter said: “I wish to advise that I issued an invoice to Norpe OY in respect of monies outstanding for commission due to Garuda Ltd. up to the end of 2006 to the value of €372,000. I obtained payment directly to myself of this amount. Dempsey told O’Higgins she didn’t connect the €372,000 referred to with the £250,000 from August 2002. She did as directed and gave the letter to Lowry. “He paid attention to it and he signed it,” Dempsey said. She said in August 2015, Michael Collins, Michael Lowry’s solicitor, told her that Lowry’s and Garuda’s appeal on a €1.1 million tax bill had been sucessful “but the trial was still going ahead”. “He sat me down and explained to me the huge importance that there was no Streamline invoice to cover the figure in question. At some point it triggered with me that I could have had some involvement with it,” Demspey said. She said she went down to the store and spent a number of days searching for the invoice that had been faxed to her in August 2002. She found it and handed it to Lowry. He read it and advised her to get it to Collins immediately. “Were you ever told that this transaction was not to be talked about?” O’Higgins asked Ms Dempsey. Ms Dempsey agreed with Remy Farrell SC, prosecuting that it didn’t occur to her, until the conversation with Collins, that the transaction at issue in the trial was the one she had looked after in 2002. “When I went looking for that document, I was hoping to find something else relating to another transaction. I didn’t know it was the transaction until I found the invoice. When I saw the invoice I nearly died,” Ms Demspey said . She agreed that even though Lowry had instructed her to raise an invoice, no invoice was ever generated by her. “I was told to oversee the payment. The transaction went through and I oversaw it,” Dempsey replied. She accepted a suggestion from Farrell that she didn’t remember the faxed through invoice until Collins spoke to her about in 2015. “It was the accountants who were dealing with,” Dempsey replied. At the start of the trial, Lowry (64) of Glenreigh, Holycross, Co. Tipperary, pleaded not guilty at Dublin Circuit Criminal Court to four charges of filing incorrect tax returns on dates between August 2002 and August 2007 in relation to a sum of £248,624 received by his company, Garuda Ltd and one charge in relation to failing to keep a proper set of accounts on dates between 28 August, 2002 and August 3, 2007. Email “Michael Lowry asked his secretary to oversee £250,000 payment, trial hears”. Feedback on “Michael Lowry asked his secretary to oversee £250,000 payment, trial hears”.